Good morning everyone! Christmas is almost here and I’m just about done with the egg! I sure hope my fiance loves it! This time around I forgot to take more pictures, however most of it is self explanatory. Hope you find this useful! 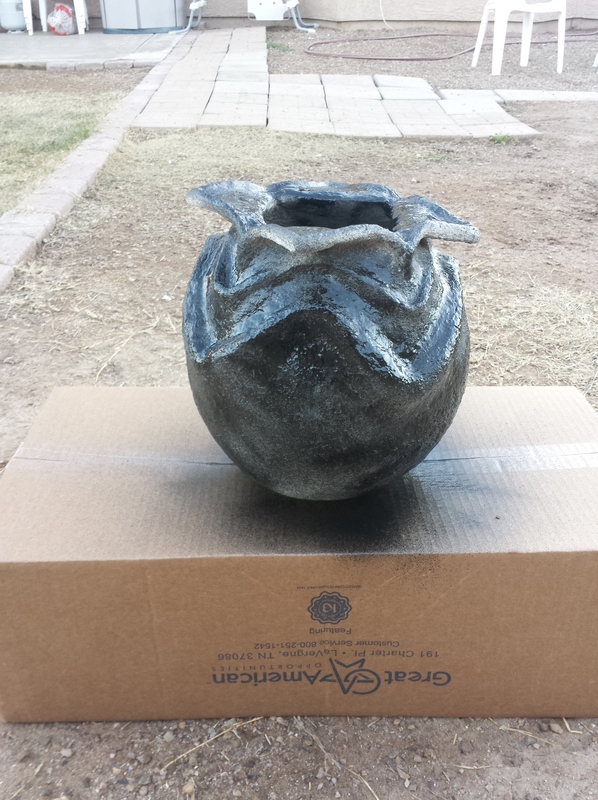 Alright, so I decided to make this alien egg a piggy bank! The image above is of the top part of the egg. 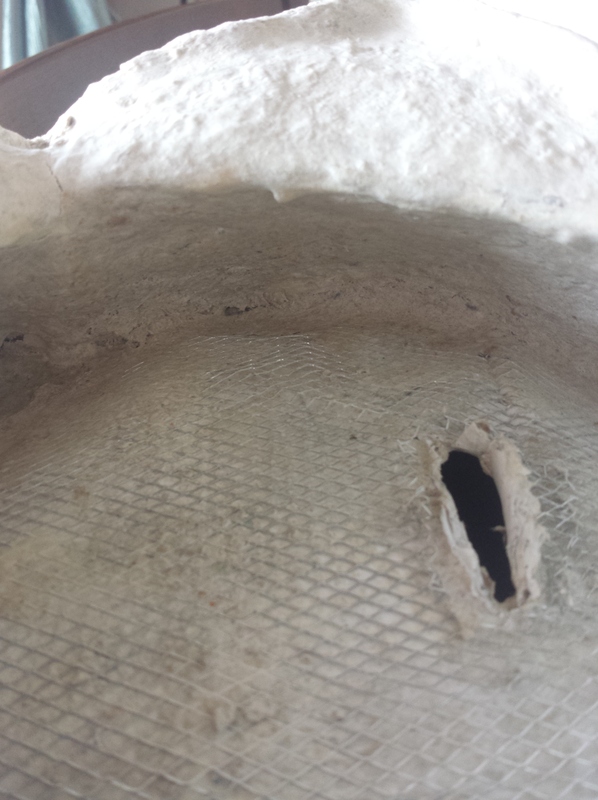 What I did was put in some wire mesh into the egg in a dome like shape. 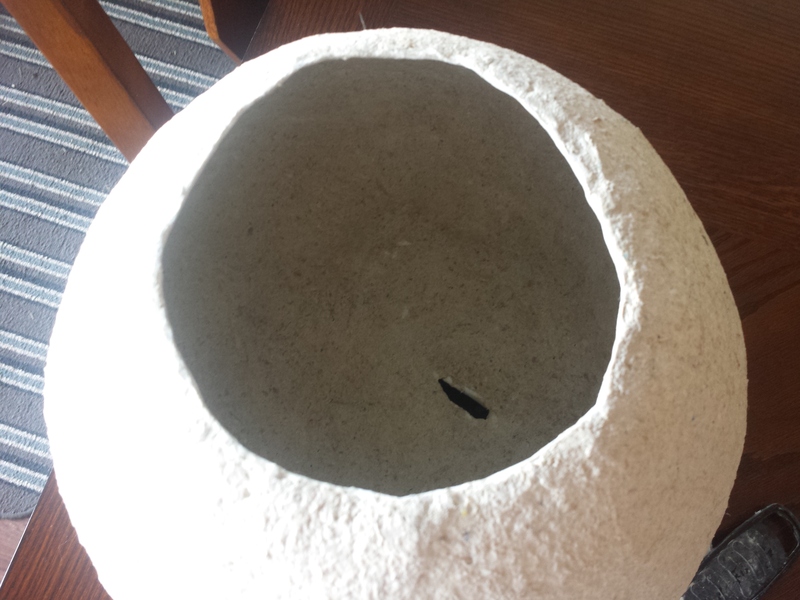 I put it in up through the bottom and attached it to the egg with the paper mache strips. 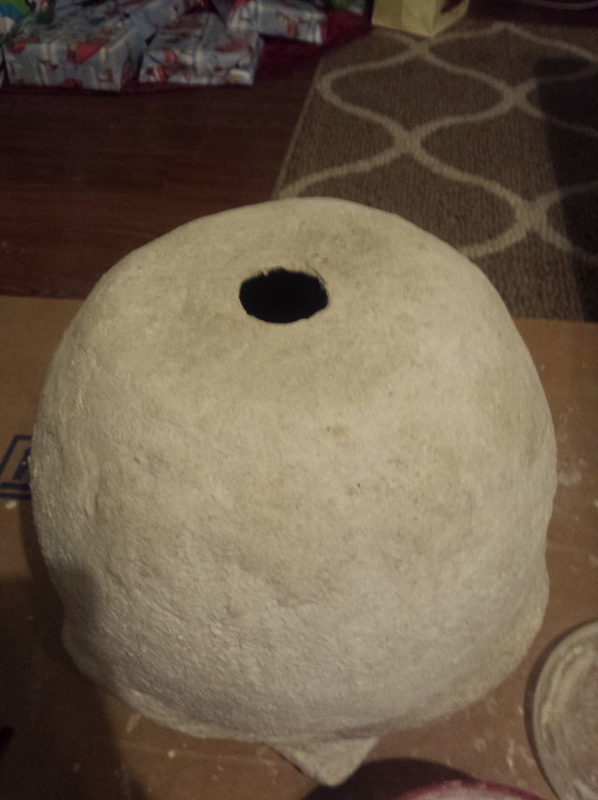 Once the inside dried, I moved to the outside and made a hole for coins! No need to make it perfect, paper clay will help with that later. 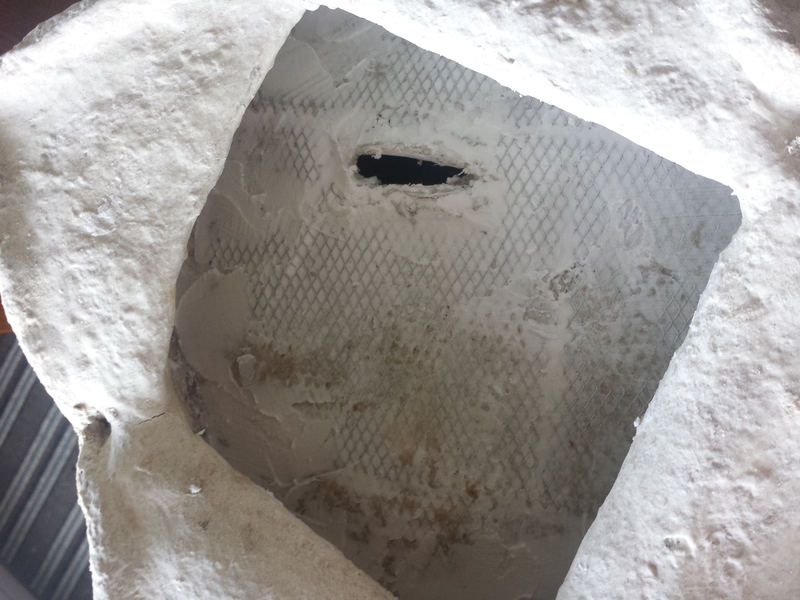 Cover the top of the wire mesh with something the paper mache clay can attach to. 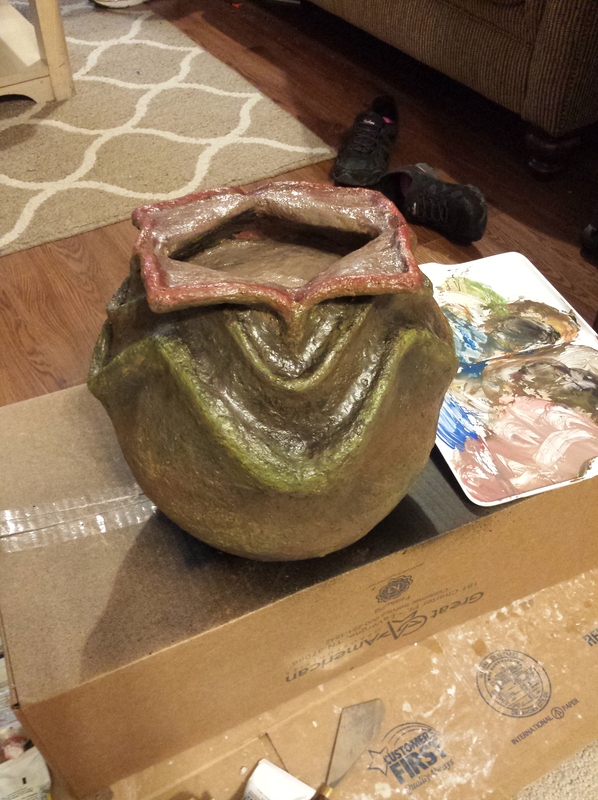 I had issues getting mine to say so I used lightweight spackle, filled in the holes between the paper mache and wire mesh, and then added the paper mache clay to the light weight spackle AFTER it dried. 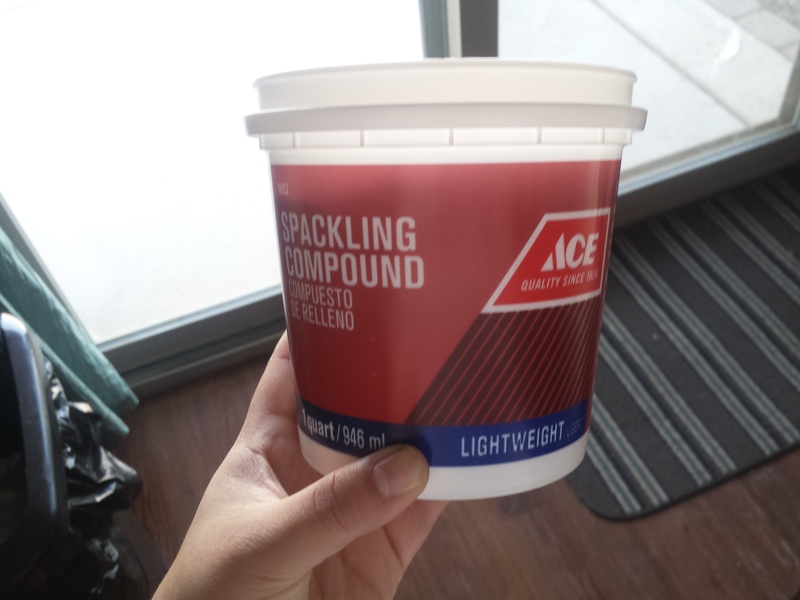 This is the lightweight spackle I used. I used light weight because I didn’t want to weigh the dome down and risk it sinking into the egg. 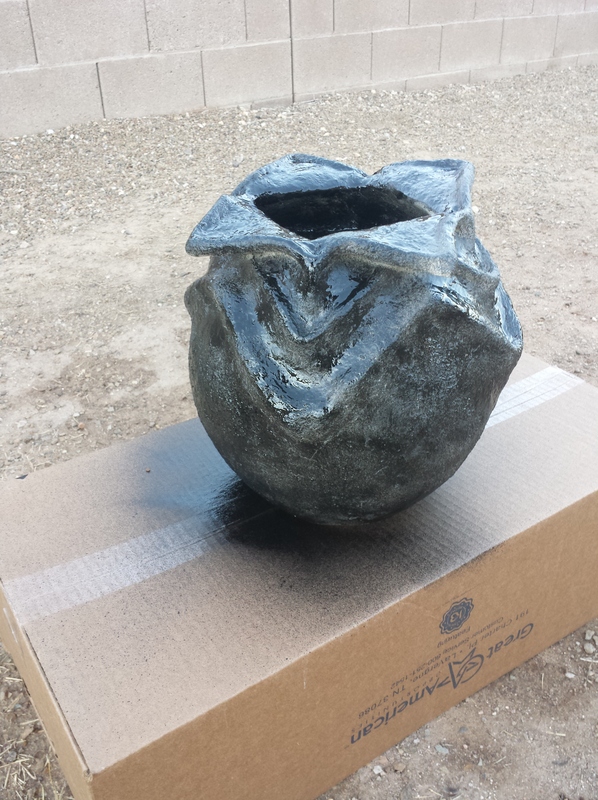 I reinforced the dome by applying a layer of paper mache clay, and let it dry overnight. 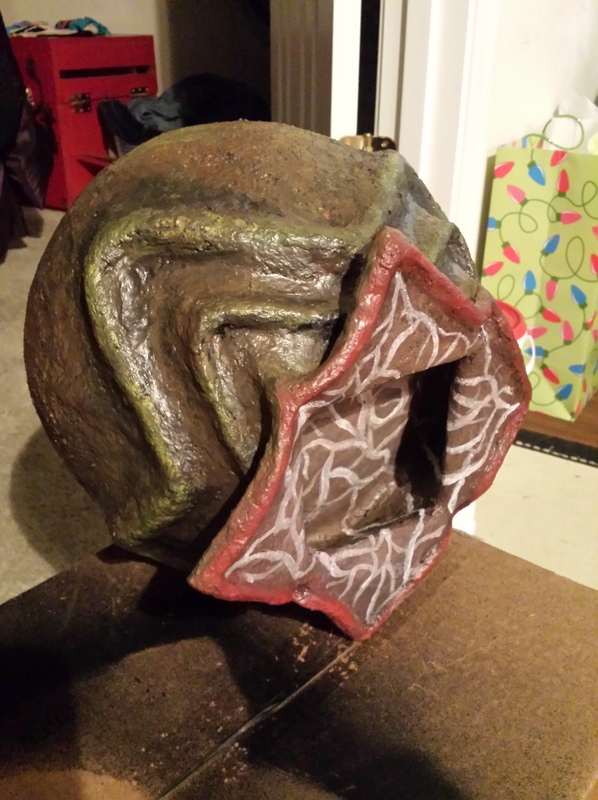 Next, I applied paper mache strips to the bottom portion of the egg so I could make it one solid piece so no coins would fall out. I did once layer of strips, let them dry, then cut a hole in the center, large enough for coins to come out when the cork is pulled. 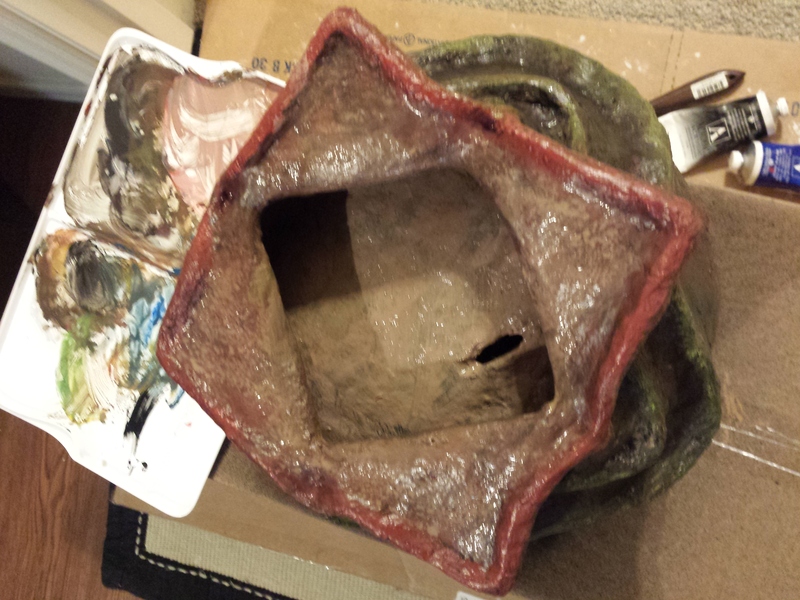 After I made the hole, I added more paper mache strips, let them dry, and then applies paper mache clay to make the base strong. I found the perfect sized cork (by accident) at Michaels. Be sure you already know the size of the cork your going to use because I can’t guarantee you will have good luck like I did! Apply PlastiDip! PlastiDip is liquid rubber, and keeps moisture out. It also works as a paint primer. Apply thin coats on with at least a half hour in-between for drying time. I used 3 colors, colbolt blue, cadmium red, and cadmium yellow, and mixed all sorts of nasty looking colors! I also used a touch of white or black for darker areas, but mainly used the primary colors. I am almost done, I just need to add a gloss to make the egg look really juicy, and I will post final, and finished pictures. 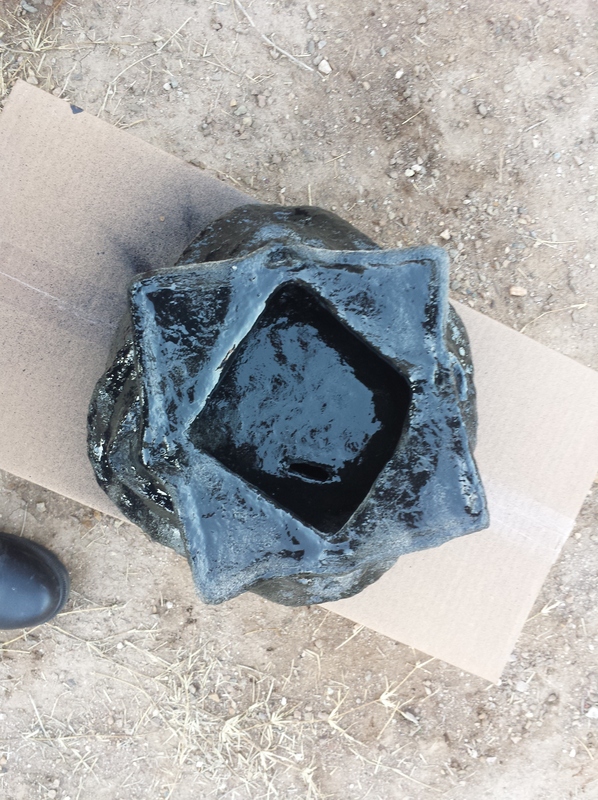 I hope this helped out anyone looking to make their own Alien egg. Here is the final product! This is what my fiance unwrapped Christmas Eve!! I made the facehugger out of foil and super sculpey. 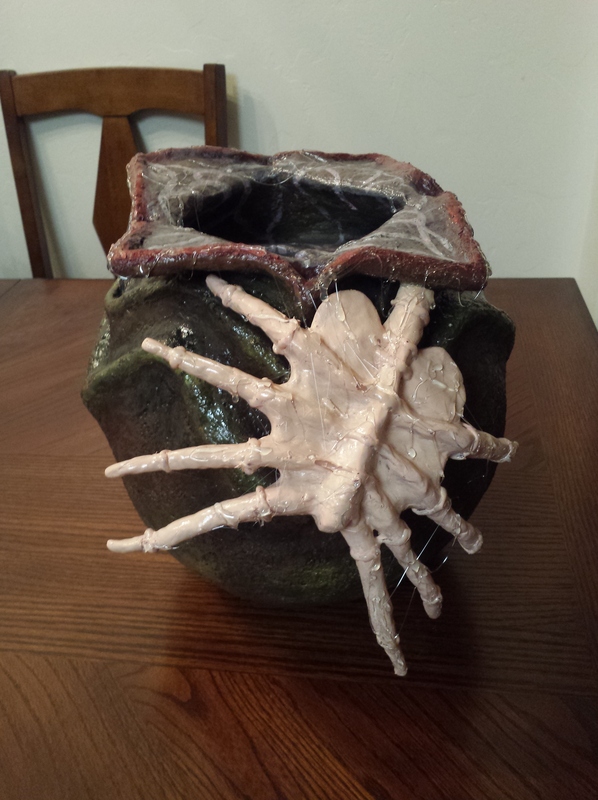 I made the basic shape of the face hugger molded from the foil, then wrapped thin layers of super sculpey around it and molded it to look disgusting like this image above. haha! Hope you all enjoyed this tutorial. Please link back if you use this tutorial and blog about it.